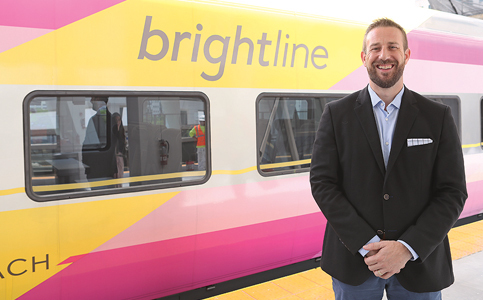 As President and CEO Patrick Goddard prepared for Brightline’s first week of Miami service, he told Miami Today that South Florida is only the beginning for Brightline’s luxury passenger rail service. Brightline is looking to use existing transit corridors to connect city pairs that are too close for planes yet too far for cars. In Florida, Brightline owns the Florida East Coast Railway, Henry Flagler’s railroad. Brightline is hoping to scale its Florida model by accessing similar railroads across the country. The novelty of Brightline isn’t the rail system itself, he says, but the careful attention to customer experience. While transportation is typically viewed as a commodity, Mr. Goddard says Brightline is elevating it to an experience. Mr. Goddard urges residents to take advantage of the competitive introductory pricing and experience the hype for themselves: “Until you experience Brightline, you really won’t understand it,” he says. Riding with Brightline isn’t just about getting from point A to point B, but the experience that begins even before you book and ends after you leave the station, he says. Miami Today reporter Gabi Maspons interviewed Mr. Goddard at MiamiCentral in Downtown Miami. The interview was recorded by Jahmoukie Dayle, and can be found Friday at http://bit.ly/2uNHy0Q.